TV Maxi Poster: Do you think you've got the skills to survive the zombie outbreak? Since 'The Walking Dead' first hit our TV screens back in 2010, the show has gone on to create a mass following of fans. 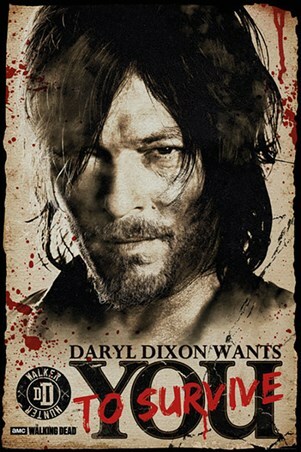 This gorgeous sepia effect poster features the brooding Daryl Dixon staring intently at the camera, as he is surrounded by a series of blood splatter patterns. The caption 'Daryl Dixon wants you to survive' is also featured at the bottom - so prepare yourself for one gruesome battle ahead.